SWITZERLAND: It’s a simple gesture, but it can help to break a world record — and mend hearts. Little Hearts is a project that gives impoverished children with congenital heart disease (CHD) access to life-saving treatment, thanks in large part to philanthropists from Saudi Arabia. To continue doing its good work, it is aiming to gain international recognition by launching a Guinness World Record attempt to create the largest-ever online photo gallery. Little Hearts is asking people across the globe to submit a picture of themselves making a hand-to-heart gesture to raise awareness of CHD — caused by a problem in the structure of the heart — and vital funds toward the projects’ goals. The Little Hearts project provides free life-saving cardiac surgery and interventional cardiac catheterization for children with congenital heart defects from underprivileged families irrespective of gender, race or religion. Each year more than a million babies worldwide are born with CHD; 100,000 of them will not live to see their first birthday and thousands more will die before they reach adulthood. “The majority of these who do survive beyond the first year of life will live in pain unless they live in the developed world where they have access to health systems,” Malik said. “That is why our ultimate aim is to provide life-saving heart operations to babies born with congenital heart defects in the Third World. Little Hearts is the flagship project of the global humanitarian charity Muntada Aid, which operates in some of the world’s most vulnerable places, providing assistance to communities affected by disasters, conflicts and poverty. The organization’s core values are faith-inspired by the Islamic tenets of integrity, transparency, the uplifting of the needy, safeguarding the vulnerable and having a sustainable impact on the world. It was initiated from Saudi Arabia in the form of a trust. In the past seven years, the Little Hearts project has conducted 27 successful week-long missions, which involve sending an expert team of 30 — including heart surgeons, pediatricians, anesthesiologists and nurses — to developing countries such as Bangladesh, Sudan, Mauritania, Yemen and Tanzania. The teams have performed dozens of free surgeries. At times many of these countries have not had a single heart surgeon who can perform open-heart surgery on babies and small children. The cause of a congenital heart defect — signs and symptoms of which can include rapid breathing, bluish skin, poor weight gain and feeling tired — is often unknown. However, it can be caused by infections during pregnancy such as rubella, the use of certain medications or drugs such as alcohol or tobacco, parents being closely related and poor nutritional status or obesity in the mother. Serious congenital heart defects usually become evident soon after birth or during the first few months of life. 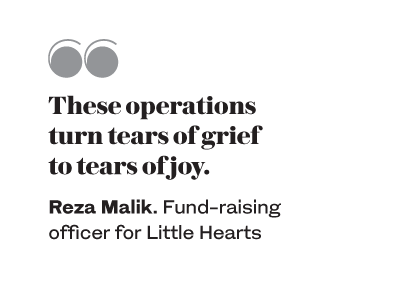 “It (the Little Hearts project) has a 97-per-cent success rate, so it is promising,” Malik explained. “The risk-to-reward ratio is extremely high. But is is not just about saving a life, but about giving the quality of life back to a child that is their basic human right. These babies are often underdeveloped; they cannot run or play like their peers. Since its launch in 2011, Little Hearts has saved the lives of more than 1,800 children. Generous donors, he said, are the heart of the project and allow the team to continue their lifesaving work. Philanthropists from Saudi Arabia have been the most prolific donors. “Initially a lot of the funding for the project, when it was first initiated, was from philanthropists from the Middle East, primarily Saudi Arabia,” Malik said. “Now we want to take this global. We want to take the Little Hearts mission and the cause of children with congenital heart defects and to turn that into a visible, viable issue and concern for the international community — from the UN to governments themselves. “Because it is not a communicable disease like malaria, there is no governmental or UN agenda to resolve the problem itself — to eradicate the disease and reduce the time it takes to provide treatment to these children. Malik said that there are two key goals of the Little Hearts project. “The aim is to continue providing the missions to the communities and countries in developing nations where they need that immediate support, because without it the governments are not going to subsidize the costs related to taking these children in these countries to places where they can get access to the treatment they need,” he said. “The short-term goal is to continue the mission, but with that is the cost of logistics, bringing those facilities to a country on a temporary basis to be able to carry out these operations and then disbanding and moving on. Little Hearts already has a dedicated center in Bangladesh, which has been fully operational for a year. A second center is about to be launched in South Africa. As well as performing life-saving operations, heart surgeons with Little Hearts also run a training program, equipping local doctors with the knowledge to perform the complex procedures. The goal over the next three years is to increase the impact of the Little Hearts project by increasing capacity in hospitals and cardiac centers in developing nations to be able to provide an international standard of specialist paediatric cardiac intervention, saving the lives of many more babies in Africa, Asia and the Middle East. Malik hopes the photo campaign will bring the awareness — and encourage the donation of vital funds — to continue and build on the organization’s life-saving work. “The campaign has two aims; one to raise awareness of the plight of children suffering with congenital heart disease; secondly to give it that platform and visibility on an international stage and among high-level governments and within the United Nations so we can engage and say these are the solutions, now there needs to be action and finances,” he said.